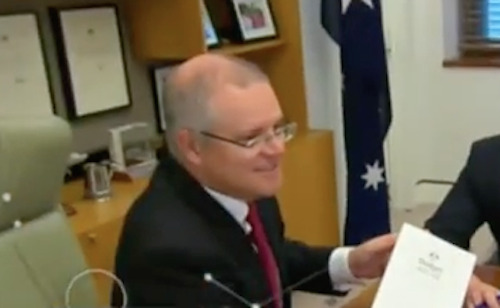 Treasurer Scott Morrison (screen shot via YouTube). Dr Martin Hirst reports on the effects of the 2017 Budget via both the Marble Foyer splendour and basement entrails of Parliament House, Canberra. THERE ARE TWO Parliament Houses in Canberra and then there’s Old Parliament House. But you only see how clearly the division runs through the hallowed hilltop hallways if you go in to the building via the tradies' entrance. This is a little-known portal into the building, known by those who need to know as "Point One". It is a well-hidden, well-guarded and highly-secure doorway, used mostly by the hidden half of the house, the cleaners, cooks, serving staff and other sundry operatives who actually do most of the work. These are the lifters. Without this unseen army of largely part-time, largely-casualised, preponderantly young and a lot more diverse than the white bread population of the carpeted corridors, the whole edifice of democracy in this country would come to a grinding halt. Point One is unusual for gateways into Parliament House, it is like travelling through the back of the wardrobe in that it brings you out behind the curtain. The basement – because that’s effectively what it is – reminded me more of a three-star hotel than the central pivot of a democratic polity. There is no carpet down there, no artworks on the walls; just pipes, steam, an unhealthy odour of rotten food and rotting feet, and hundreds uniformed waiters, kitchen hands and security guards. I used the underground entrance to Parliament House while I was in Canberra for Federal Budget week and it gave me a great visual representation of the problem I was trying to nut out for myself: Why does this building seem like such a perfect metaphor for the division between "lifters" and “leaners"? The “leaners”, who’ve done well out of the Budget, and the “lifters” who will pay the most in terms of new taxes, tax (sorry, levy) increases and increases in the cost of living don’t exist in this building in the same way. The leaners mostly come into Parliament House via the public front door, but they can also come in more discreetly at either the House of Representatives or the Senate wing doors. But here it’s "No pass, no entry". The lifters use the tradies' entrance and are mostly invisible to other inhabitants and to most visitors. The leaners are also well-represented by the lobbyists and spin-doctors who occupy the outer rings of power. I ran into one during one sojourn through the Marble Foyer — a former journalist and scion of a well-connected conservative political family. He is now a paid mouthpiece for one section of the leaner class. No doubt he was in the building to celebrate at one of the sponsored functions that crowd the political calendar in a week like this — at least if you’re an insider and can afford the tickets. The lifters were cooking, serving, securing and washing the dishes of the leaners this week and I reckon hardly anyone, except me, even gave them a second glance. But the basement-dwellers of Parliament House are the real story of this budget. Precarious workers in precarious jobs, with a precarious future to look forward to, while the well-fed and well-moisturised suits (of both genders) talk loudly of how well they are doing under this government, give themselves a pat on the back and think nothing of having another chardonnay. Jacqui Lambie calls for politicians to be drug tested. Why not? Seems fair! This is another difference between the leaners and the lifters. While the leaners can enjoy their substance of choice, those on the bottom of the pile are facing more punitive measures if they attempt to alleviate the ennui of their lives with a little recreational drug use. One law for the leaners, one law for the lifters. The unfairness of the budget is parsed in this one initiative. It was Jacqui Lambie who suggested that if we’re going to drug test people on welfare to see if they are "deserving" of their public handout, then the politicians and others in Parliament House should also be subject to this policy. After all, she reasoned (most reasonably), that if accepting public funding while drunk or stoned is to become an offence for one section of society, then it should be applied across the board to anyone who accepts such monies. Personally, I think this is a little extreme and I am not in favour drug-testing anyone, but it shows just how quickly and how widespread opposition to the idea has grown in less than 72 hours. The Australian Council of Social Services (ACOSS) has slammed the drug-testing proposal and says the welfare sector will find it hard to work with any frontline agencies that are forced to implement the policy. As ACOSS CEO Dr Cassandra Goldie pointed out, the cost of compliance will greatly outweigh any savings gained by reducing a drug user's dole payment for a couple of weeks. Greens Senator Peter Whish-Wilson is claiming credit for coining the term “half-arsed budget” less than an hour after the Treasurer’s speech on budget night. It is a phrase that I had started using before I went to interview him on Wednesday and I think it sums up perfectly what #Budget2017 has been all about. There was nothing in this budget to get excited about. A levy (not a tax) on banks, which they’ve already said will be passed on to customers, drug-testing alleged dole cheats and $75 billion in infrastructure spending that doesn’t start to kick in for another couple of years at least. Then there are all the pea and thimble tricks to make it look like spending on health and education is being increased, but which, in reality, hide the fact that the new figures are still major cuts when you take into account what was taken away in budgets from 2014 onwards. If “half-arsed” is the most accurate description of the 2017 Budget, then “Labor-lite” must be the most insulting, disingenuous and misleading. I saw that this was Andrew Bolt’s take this week, but that just shows how far to the right he’s listing. A little bit of mild Keynesian pump-priming and a tax on banks (which we will pay anyway) is hardly evidence of ScoMo’s sudden conversion from Christian crusader to Communist comrade. Understandably, Labor MPs were furious that a welfare-attacking, pro-business Budget could be characterised as a “Labor’ style policy. Labor MP Graham Perrett says, if anything, it’s a “zombie version” of a Labor budget. Andrew Bolt’s opinion is irrelevant – he still wants Tony Abbott back in the Lodge – but this budget is evidence that Turnbull is trying to occupy the political centre and present a small target. The jobs at the centre of Coalition budget thinking this week were ScoMo’s and Turnbull’s. There’s already speculation bubbling up that 2017 will be Morrison’s last budget presentation; it could be Turnbull’s too. Nobody is happy with the Budget, except perhaps big business groups (with the possible exception of bankers) and that is not the sign of a prime minister skilfully navigating the middle ground — it is a signal that the captain and the crew on the bridge have no idea what to do next to save their skin at the 2019 election. When I watched Question Time on Wednesday – traditionally a day when the Government is soaking up praise and gloating about its successes – the Coalition side was subdued and the Opposition benches were enthusiastically interjecting and clearly enjoying themselves. ScoMo and Fizza both know that, while the $13 million of so-called “zombie measures” from previous budgets have been quietly dropped, there is plenty in #Budget2017 that could still bring the Coalition undone in the Senate. Most interestingly, it could be a bank royal commission is forced on them during this term, which will negate any good work of this budget week.